Germany happens to be not just a lovely country but among-st the highly influential countries in Europe. It consists of 16 constituent states and covers an area of 137,847 square meters. Germany has about 80.6 million inhabitants with the largest city being Berlin. With Germany being a major political and economic power player, with a rich cultural and historical heritage, it is no surprise that skilled individuals are attracted to Germany Migration. This European Nation boasts of a high-class education, exquisite lifestyle, a top-notch healthcare system, etc. The Germany Job Visa is meant for foreign nationals who have the intention of working in Germany. It is a residence permit offered on long-term and allows the individual resides in Germany and job hunt within 6 months. Once the 6 months elapse and you were opportune to get a job, you will eventually be granted the Germany work visa or work permit which will allow you to live and work in Germany. Have a Bachelor or Master's Degree from a German university or possess a foreign degree equivalent. Possess a minimum of 3 years of work experience related to your course of study. Show evidence of having enough cash to last through your stay in Germany. Possess a medical or travel insurance that will last thru your entire stay in EU nation or up until you are granted a work permit. You gain access to one of the richest and most developed countries in the world. Availability of world-class health care system. Visa processing time is short. Qualified professionals earn good money. You can get a temporary residence permit of 6 months. If you get a job within the 6 months, you can apply for a work visa. Ensure you have all your documents ready to be submitted alongside your application to avoid rejection based on not meeting the set criteria. A genuine passport obtained not later than 10 years with a validity of at least 12 months. A detailed Curriculum Vitae (CV). A covering letter if possible on one page, stating the purpose of your application, how you intend to get a job and your backup plan if perhaps you fail to get employed. Your work experience letters. From your offer letter, promotion letter, etc. Evidence of shelter in Germany. Proof of funds like a bank statement which will show that you can fund your stay in Germany. Evidence of your category in your country. Before you invest your time and money in pursuing a German Job Seeker Visa, it is advisable you engage the services of qualified Germany immigration consultants in order to confirm if you are deemed qualified so as not waste your money. At Opulentus, our Visa Consultants happens to be one of the best and well equipped with whatever information regarding your immigration. 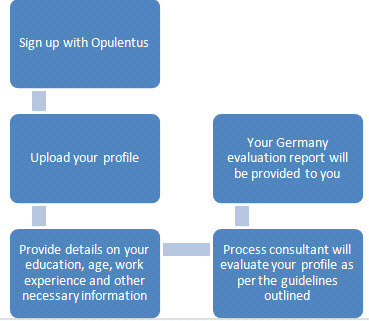 We offer Germany Skilled Job Seeker Visa Evaluation Report which will check your eligibility after a thorough assessment of your profile based on the set parameters. Let us guide your family with Hong Kong Immigration Services either for QMAS Visa, Spouse visa or any other Immigration Service.